How to use plain text smileys (disable automatic emoji substitution) in Messages.app? How to use plain text smileys (disable automatic emoji substitution) in Messages.app? In OS X 10.8 there was a setting for this in the app’s Preferences pane, but in OS X 10.9 that doesn’t seem to be the case anymore. Go to the Edit menu, submenu Substitutions, then uncheck Emoji. Not the answer you're looking for? Browse other questions tagged messages preferences mavericks emoji . Difference between US QWERTY and International QWERTY Apple keyboards? How did Starbucks send bold text in an MMS to Messages? How can Mail.app in Mavericks show a messages plain text alternative? 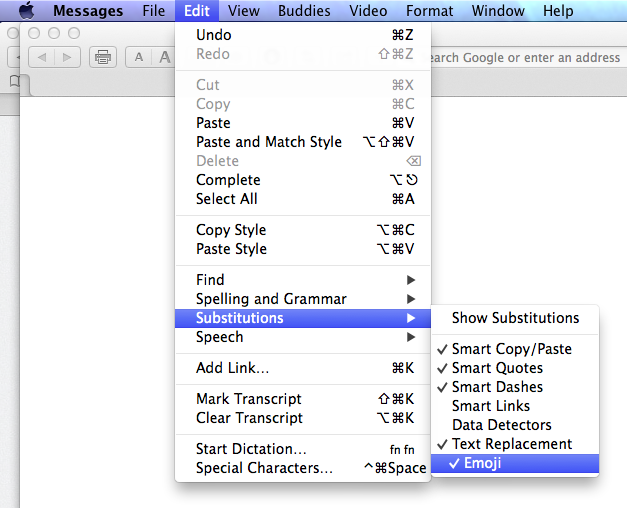 How do I change the default mapping for Emoji Text Replacement in Messages on OSX? How can I use emoji on my Mac as easily as I can on my iPhone?